Legal descriptions are used to describe real property in legal documents like the deed to your land. It is the written record of the intended location and size of a particular parcel of land within a city, county, and state. This is accomplished sometimes by simply referencing a lot or parcel designation from a recorded plat. Other times a more specific description is required. Several types of land transfers and transactions, including ownership of real property, granting of easement rights and rights of ways require a legal description to be written. A survey will need to be done for a proper legal description to be formed. Our legal description service is often sought to ensure the detailed property description contained within is precise, accurate, fluid, and mathematically true and correct. Without a proper description, you, as the seller, may find that your sale was void due to an improper land description. Courses and distances is one of the oldest methods of describing land. A definite point of beginning is of utmost importance in this type of description. From that point of beginning, a line running a certain distance is drawn to another point, and then from that point, the line is drawn a certain distance to another point, and so on until the line returns to the point of beginning. Commencing from the northwesterly intersection of Independence Boulevard and Colby Street; Thence along the northerly right-of-way of Independence Boulevard N 26°00’00” W a distance of 475.25′ to a drill hole set, which is the Point Of Beginning; Thence N 26°00’00” W a distance of 37.95′ to a pipe found; Thence with a curve turning to the left with an arc length of 95.92′, with a radius of 500.00′, with a chord bearing of N 31°29’45” W, with a chord length of 95.77′ to a pin found; Thence N 36°56’46” W a distance of 4.74′ to a pin found; Thence N 26°00’00” W a distance of 14.65′ to a pin found; Thence N 40°43’00” W a distance of 42.31′ to a pin set; Thence N 36°56’46” W a distance of 149.48′ to a pin found; Thence with a curve turning to the right with an arc length of 54.41′, with a radius of 25.00′, with a chord bearing of N 25°24’22” E, with a chord length of 44.29′ to a pin found; Thence N 87°45’30” E a distance of 334.83′ to a nail set; Thence S 02°14’30” E a distance of 237.84′ to a pin found; Thence N 87°45’30” E a distance of 313.00′ to a point; Thence S 02°14’30” E a distance of 84.00′ to a point; Thence S 87°45’30” W a distance of 313.00′ to a pin found; Thence S 02°14’30” E a distance of 9.00′ to a pin found; Thence S 87°45’30” W a distance of 173.26′ to the northerly right-of-way of Independence Boulevard at a drill hole set, which is the Point Of Beginning, and having an area of 115,214 square feet or 2.6450 acres. Every legal description (often referred to as a “legal”) must begin somewhere, and that “somewhere” is called the point of beginning. No guesswork is allowed for the point of beginning. If it cannot be ascertained, then it is impossible to definitely ascertain the rest of the legal correctly. Thus, a point of beginning must be either (1) at a known point (such as a monument) or (2) at a certain course and distance from such a known point. The reason for such exactness is simply that there is no other way for the true boundary lines to be described in writing. Of course, in a short legal, the point of beginning is not described in the instrument using the short legal; but if the point of beginning is not described in the referenced instrument, then the short legal is defective. All beginning points are true points of beginning, but when the phrase is used in an instrument, it distinguishes the actual point of beginning from a known point used to ascertain that point of beginning. A plat or survey is, of course, a drawing of the boundary lines of a tract of real estate. If the survey does not indicate a point of beginning, then the exact locations of the boundary lines are not ascertainable, just as with a written legal description that does not have a point of beginning. Sometimes two different deeds will use two different points of beginning in describing the same tract of land. For example, one deed will show so many feet from a street corner, and another deed will show so many feet from a different street corner. As long as both points of beginning are correct, there is nothing wrong with this; however, sometimes an examiner cannot verify both points of beginning from the record. Thus, it might be necessary to call for a survey showing both points of beginning. Calls in a legal description are by course, meaning direction, and distance, meaning length. Each call describes the course (direction) and distance (length) of a property line. There are several methods of describing a course on paper. Calls of “north,” “south,” “east,” and “west” are generally treated as true and exact directions. A call of “running thence north 100 feet to a point . . .” is a valid call. Such courses really should be used only when there is a true north (or other) direction, and only for property lines that are straight lines. Bearings (compass points based on true north and south) and angles (which are based on degrees, minutes, and seconds constituting a circle) are also often used by surveyors to show direction. Bearings indicate course or direction. For the purposes of legal descriptions, consider bearings as compass points based on true north or true south; think of four quadrants: northwest, northeast, southeast, and southwest. Each quadrant is divided into degrees, minutes (60 minutes to 1 degree), and seconds (60 seconds to 1 minute); each quadrant has 90 degrees. For illustration purposes, consider that the northeast quadrant runs from north 0 degrees east to north 90 degrees east, the northwest quadrant runs from north 0 degrees west to north 90 degrees west, the southeast quadrant runs from south 0 degrees east to south 90 degrees east, and the southwest quadrant runs from south 0 degrees west to south 90 degrees west. These designations (such as north 0 degrees east, south 90 degrees west) are rarely, if ever, used by surveyors or in deeds, and the designations “north,” “east,” “south,” and “west” should be used. They are noted only to illustrate the concept of the quadrants and bearings. However, a northeast call is the exact opposite direction as a southwest call, and a northwest call is the exact opposite direction as a southeast call. For example, the exact opposite direction of “north 36 degrees 40 minutes 10 seconds east” is “south 36 degrees 40 minutes 10 seconds west.” This is important because drafters sometimes reverse directions when drafting documents. Also, surveyors do not always survey a tract from the point of beginning, then continuously around the tract; sometimes they will survey the front, then the rear line, then another line, and so on, and not always from the same direction; and sometimes they do not transpose bearings on the survey. This does not make the survey improper, but a legal description drawn from the survey could be improper if the drafter is not careful. Another requirement of a legal description is closure. You must be able to begin at the point of beginning, follow each successive course and distance, and end at the point of beginning. Technically, you should be able to trace the boundaries without lifting your pen from the paper from the point of beginning and back; otherwise, the legal description does not close. Closure problems can be created by erroneous points of beginning, erroneous courses, and erroneous distances. A lawyer must be careful if he or she cannot draw to scale or draw exact bearings, angles, and distances. Normally, erroneous beginning points and courses make closure problems obvious, but erroneous distances (if not known to be erroneous) are not so easy. When three sides of a square tract are 100 feet each and a fourth side is 200 feet, the problem is evident; but if the tract is of an irregular shape, or if the distances do not vary so greatly, it may be impossible to detect a closure problem. 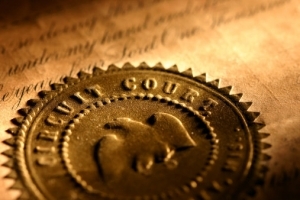 A lawyer must also be careful if a deed is drawn exactly like a survey; as discussed in the earlier section titled “Bearings,” the legal may not close, and the deed will be incorrect, even though the survey is correct. When referring to a record in a land description, it is generally preferable to set forth the tract or lot and block (or other designation) followed by “ according to the official plat thereof.” The description should also provide appropriate recording or filing information, including the government office in which the official plat can be found. This reference to a recorded plat relieves the drafter of the burden of reciting all of the other details contained in the plat which add certainty to the location of the parcel on the ground. Whenever additional information, such as acreage quantity, a metes and bounds description or identification of prior conveyances is provided, the drafter should be careful to confirm the accuracy of all the information and ensure that there is no conflict with the information set forth in the official plat. Better yet, the drafter should consider not including additional information unless it is necessary to reflect the intent of the parties. Too often, the inclusion of additional information confuses rather than clarifies the description. Care must always be taken in the preparation of all descriptions to avoid the need for legal action and to perfect the rights being obtained. A description written incorrectly may cause overlaps or gaps with surrounding properties, title problems, and even worse, the construction of improvements on the wrong property. The best advice is to repeat the guideline used earlier for preparation of legal descriptions: “the preferred method of writing descriptions is to use the best type or combination of types and parts that will give the clearest and shortest description possible.